Sharks, grizzly bears and big cats may strike fear into your heart and brain, but they do not even come close to being the deadliest animals on earth. 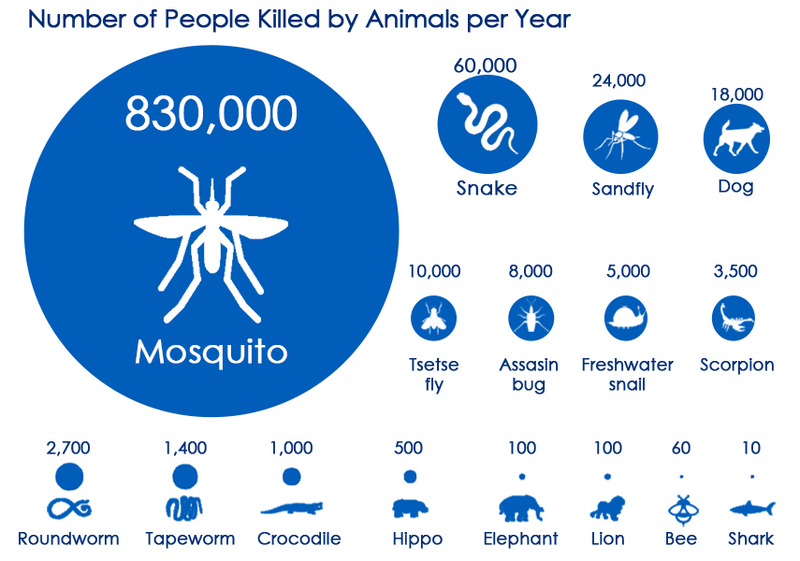 The world’s deadliest animal is the Mosquito. As you can see mosquitoes are not just annoying little buzzing, biting bloodsuckers, but they also transmit very deadly diseases. In fairness, it is not actually the mosquito that kills you with its probing proboscis, but rather the pathogens that enter your body when the mosquito feeds. Every year about 830,000 people die due to mosquito-borne illnesses like malaria; and we hope to bring increased global awareness of the deadliness of mosquito-borne illnesses. What is the best-insect repellent for toddlers?